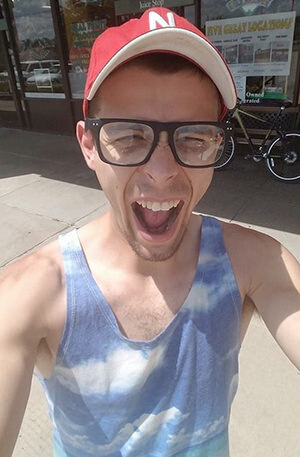 Say Hi to Rocky Dumais…a millennial movie buff who crashed his mother’s car driving like “Ace Ventura”. Apparently, the wipers in his mom’s Buick Rendezvous weren’t working which forced him to do the only logical thing, stick his head out the window. Unfortunately, he was registering a .137 blood alcohol level and he crashed his paraphernalia laden car into a tree and up rooted it. Rocky did the only responsible thing and fled the scene of the accident…possibly because he had a suspended license. He racked up charges of driving on a suspended license, DUI, possession of paraphernalia, careless driving AND leaving the scene of an accident. Rocky walked away unscathed from the accident but caused about $500 in property damage. Odd looking guy. And, he's a moron when drunk apparently. He wrecked the car, so I guess he'll have to get drunk in his mom's basement from now on. Horse face guy who needs to eat a sandwich get his teeth fixed... oh hell skip it just lock him away for being a doofus who cannot hold his booze. Freaking loser. Guys, I have footage of the crash!!! Mom's Buick Skylark will never be the same.